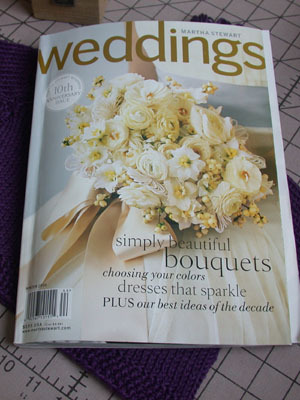 gringa.org: Dress, ring, yarn, flowers... wait, YARN?! Dress, ring, yarn, flowers... wait, YARN?! 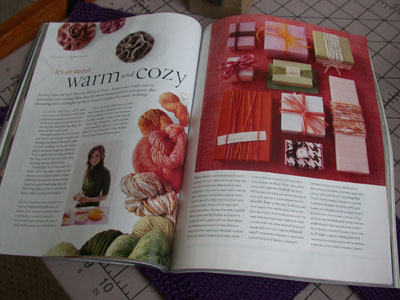 Colleen wrote today that she had unexpectedly found a knitting article in her Cooking Light magazine. This just happened to me in the last week. I was sitting with a magazine in my lap, but I was talking to Jason and watching television at the same time so I wasn't giving it my full attention. When I saw the pretty yarn, I left it open in my lap so that at the next pause in conversation/commercial I could give it a better look. And for the record I will not be using yarn as a "decorative element" at the wedding. I love yarn as much as the next knitter, but a girl's gotta know when to say when. And besides, can you imagine wasting all of that perfectly good yarn?!?! I haven't seen the Cooking Light article, but I've heard the illustrations are wrong and they teach the knit stitch twisted... I'm sure they'll get a million emails about it. And, btw, I tried that self-fringing shawl (as a scarf) and it worked!! It was like magic! The only thing is that one end was perfectly straight but the other end had a perfectly even bias... I knit it in mohair, so I can see how it would have been very easy to pick up extra sts, but in a perfectly even way? So I'm trying to figure out how to undo some sts and then lock them back together without resorting to tying knots.